This is my first letter to you as the new president of the Alberta Medical Association. The opportunity to interact with all of you is one of the things to which I have been looking forward in my term. This newsletter may be a little longer than other issues, but because we are talking about how well you think alberpatients is working, I hoped you would pardon some extra words. Following our first few months of operations (and an expected lull at the end of summer), recruitment to albertapatients is on the upswing again. We are pushing toward our first 1,000 members as I write (keep telling your family and friends). We have a long way to go; we hope one day to have as many as 15,000 people enrolled in the community! As we look ahead to the fall, we also want to ensure that we are meeting your expectations. That’s why we ran a special survey in the last few weeks about your impressions of albertapatients. Attached to this newsletter you will find a summary of the results. In general, members are reasonably satisfied with the experience, but a fair number of participants are still making up their minds. (We’re happy to say that only 4% reported they were dissatisfied). 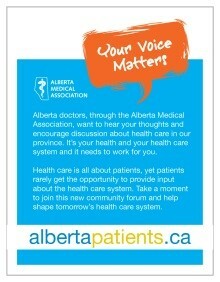 To make albertapatients more meaningful, most people would like to see a clear articulation of what we are doing with the opinions and input that you provide. And, you’d like to know that what you are doing is making a difference! So what have we done since the first member joined on June 13? Survey results from albertapatients have been used to help inform discussions of the AMA board of directors to help plan advocacy activities for the year ahead. Media coverage has generated calls and queries from government and health care support organizations. It's apparent that, even with the small amount of research we have done so far, people are becoming aware of albertapatients.ca and that it's being seen as a place to look for insight on what Albertans think. In the year ahead we will be implementing some new processes to help ensure that the voice of patients drives the topics of discussion. 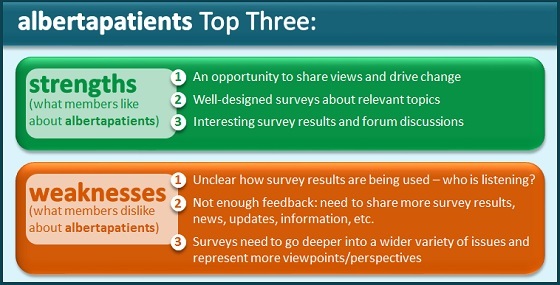 We are also exploring where the outcome of your surveys and discussion forums can make a positive difference. Please be patient with us – and keep telling us how we can improve. We are learning as we go, but comments such as you have provided will help to guide us. We truly do want to make this your space. In doing so, we believe we can generate the most value for the health care system. In September, we asked a group of albertapatients members about their perceptions of and experiences with this initiative so far. The individuals we spoke with were selected based on when they signed up: we were looking for feedback from our most experienced members versus those who recently joined and may not have participated in any surveys, browsed the discussion forums, or explored our website yet. For highlights from that survey, please read on to the Did You Know section, below. albertapatients Member Perceptions. Did you know? 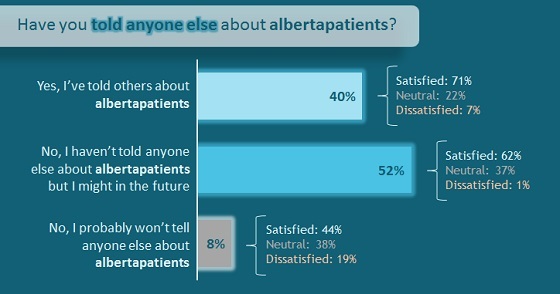 Members are reasonably satisfied with albertapatients. Members are talking about albertapatients. Our best endorsements come from members - we're thrilled that 40% of those we spoke with have told others about this initiative and another 52% would consider telling others about us in the future. If you're not sure how to introduce or explain albertapatients to a friend or family member, log in to albertapatients.ca and check out the Refer a Friend box for social media buttons and a short introduction you can share by email. Members think albertapatients has potential, but there are things we can improve to make this initiative more meaningful. Our team is very excited about and committed to this initiative, and we hope you will be too. As always, if you would like to make comments, share feedback, or suggest an area for further research, Let Us Know.